Facebook just launched a new version of its Messenger app for iOS. Messenger, the company’s stand-alone chat app, got a bit of a user interface refresh with this update, as well as a speed boost and official support for iOS 6 and the iPhone 5’s larger display. Today’s update comes just a bit more than a week after Facebook also launched an update to its Messenger app for Android and, for the most part, this update brings the iOS app’s design on par with the Android app. 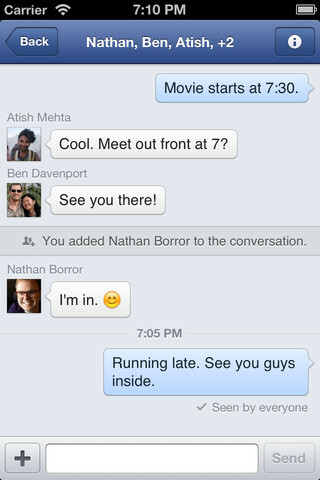 The conversation view, for example, now uses chat bubbles, which make the app look more like a text messaging app like Apple’s own iMessage. The previous version, as our own Sarah Perez pointed out when she reviewed the Android update, looked more like your email inbox. In addition, the iOS app now brings up a list of all of your friends who are currently online when you swipe to the left. From there, you can now also easily pin those friends you talk to the most to the top of your Favorites list. One feature that’s missing from the iOS app, though, is the ability to text with your contacts from within Messenger. It’s worth noting, however, that only a few Android devices currently support this feature.